Nuclear fission can occur when a nucleus is rendered sufficiently unstable by the capture of a passing neutron. The probability for a fission reaction to take place depends much on how energetic these neutrons are. The knowledge of their energies spectrum is vital for an understanding of how nuclear reactors work. One classifies these neutrons in groups according to their energy ranges, the most important being the 'fast' and 'slow' neutrons. This repartition of the neutrons in a pressurised water reactor shows the different roles played by slow and fast neutrons. Slow neutrons are responsible for most of nuclear fission and therefore help sustain the chain reactions. Fast neutrons, on the other hand, play a small role in fission but can transform nuclei of uranium 238 into fissile plutonium 239. Other neutrons are lost when they are captured by 'sterile' nuclei or when they escape from the reactor as they slow down. Among these, some can poison the performance of the reactor, others are used for the control of the chain reaction (control rods). After a series of collisions with different nuclei, the energy of neutrons produced by fission reactions drops to the order of a few electronvolts or a few fractions of an electronvolt. Neutrons with energies in this range are collectively referred to as 'slow', and neutrons whose energies match those of the surrounding atoms are known as 'thermal'. It is these slow neutrons that allow for nuclear reactors to run with fuel based on natural uranium or uranium lightly-enriched in fissile isotope 235. Without them, the most common pressurised (PWR) and boiling water (BWR) reactors would not operate. As a result, the neutrons emitted by nuclear fission have to be slowed down by collisions within a medium called a moderator. Reactors operating with natural uranium fuel, which contains only 0,7% of fissile uranium 235, require efficient moderators which absorb very few of the neutrons : such moderators are heavy water and pure graphite. Before they are slowed down by a large number of nuclear collisions, neutrons produced by fission reactions are known as 'fast'. They usually have energies between 0.1 and 2 or 3 MeV . The fact that they possess a substantial amount of kinetic energy allows fast neutrons to fission more easily nuclei once they get captured. They can therefore split not only nuclei reputed fissile by slow neutrons, but also minor actinides, the heavy nuclei which build up inside nuclear fuel as radioactive waste. Fast neutrons are needed to eliminate these waste products. 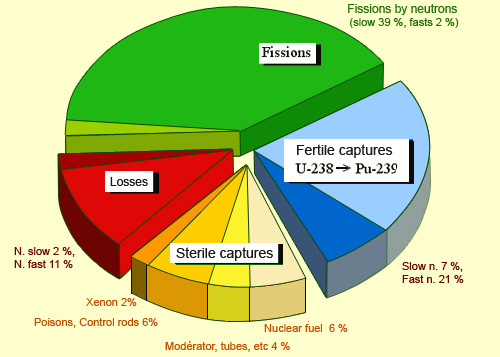 The use of fast neutrons in so-called ‘fast reactors’ allows for the production of more fissile nuclei than are destroyed, as the absorption of at least one neutron per fission by an uranium 238 nucleus transforms this uranium 238 into a fissile plutonium 239 nucleus. This process is known as breeding, leading to an almost inexhaustible supply of nuclear fuel. One drawback of fast neutrons in reactors is that the probabilities of their capture by nuclei are comparatively small. Travelling in matter, neutrons see nuclei as targets. The apparent cross-section of these targets is much more smaller for fast neutrons than it is for slower neutrons. As a result, an intense neutron flux and a fuel rich in fissile elements are both needed to compensate for this lower probability. 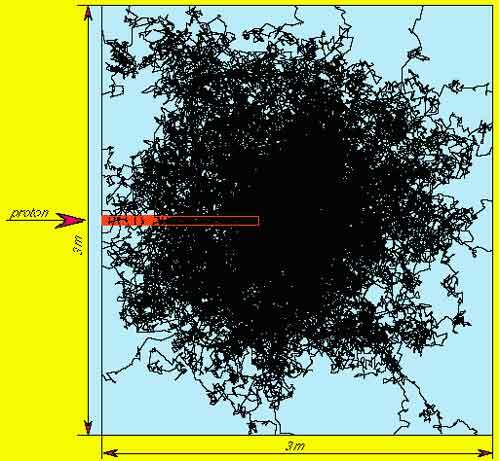 Paths of fast neutrons in a massive block of 350 tons of lead have been simulated. Neutrons are produced by the impact of very high energy protons penetrating the block from the left. Neutrons undergo a large number of collisions before slowing down. In a collisions with lead, an heavy nucleus, a neutron loses only a small fraction of its energy. On the contrary, in a medium rich in hydrohen like water, the slowdown is much faster requiring much less collisions. This is reason for the use of a water moderator in conventional reactors, for which a rapid slowdown is needed.